The Kawasaki Ninja ZX-10R is a 1000cc, four cylinder, four stroke, street motorcycle manufactured by Kawasaki. Kawasaki's follow-up to the ZX-9R sportbike. The highly-praised ZX-10R combines the handling of an older, less technologically advanced 600 cc bike with the performance of a litre bike, making it the ultimate track tool. Its ultra-narrow chassis, low weight, radial brakes, and its 180 bhp engine make it a very competitive package for its Japanese rivals: Suzuki's GSX-R 1000, Honda's CBR1000RR and Yamaha's R1. The "Ninja" ZX-10R puts Kawasaki at the front of sportbike design and performance. Capable of exceeding 100 mph (160 km/h) in first gear, from the overall shape to the smallest detail, the ZX-10R combines high technology with the latest innovations, including a new, high-output engine, ultra-narrow aluminum frame, ergonomic design and compact bodywork with a frontal area smaller than those of most 600 cc sportbikes. The 2006 model has a MSRP of $12,199 USD. Kawasaki engineers utilized a "stack" design for the extraordinarily compact, liquid-cooled, 998 cc inline four-cylinder engine. The crank axis, input shaft and output shaft of the "Ninja" ZX-10R engine are positioned in a triangular layout to reduce engine length, while the high-speed generator is placed behind the cylinder bank to reduce engine width. With a bore and stroke of 76 x 55 mm, the ZX-10R engine's one-piece cylinder and crankcase assembly reduces weight and increases rigidity. The double overhead cams are machined from chromoly steel billet for strength, four valves per cylinder improve high-rpm breathing, and the forged, lightweight pistons offer high heat resistance to further enhance the bike's power-to-weight ratio. In addition to liquid cooling, the ZX-10R engine features a liquid-cooled oil cooler adjacent to the oil filter to reduce oil temperatures. "Slosh" analysis was also used to design the internal structure of the oil pan, thereby reducing windage losses and helping to maintain low oil temperatures. The radiator is provided by Denso and helps reduce weight. A multi-plate wet clutch with a back torque limiter transfers power to a six-speed, close-ratio transmission idealized for closed-course competition. The back torque limiter automatically disengages the clutch under hard braking and deceleration to prevent rear wheel hop during corner entry. A new six spoke wheel design is claimed to be almost as light as special purpose race wheels. And the rear tire size has been increased from 190/50 to 190/55 ZR17. The ZX-10R was introduced in 2004, with minor revisions in 2005. It replaces the venerable ZX-9R and its decade long reign. 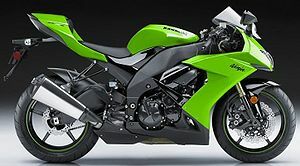 The complete overhaul to the ZX-10R in 2006 sees the most comprehensive round of changes since the bike was introduced. In 2004 and 2005 the ZX-10R won "Best Superbike" and "Masterbike" from Cycle World magazine. The first Kawasaki Ninja was in 1984. In 1986 Tom Cruise rode a Ninja in the film "Top Gun". This page was last edited on 26 August 2010, at 18:36.